One of the best things about growing oca is that it is generally very resistant to disease. Unlike potatoes, which are vulnerable to more than a dozen common diseases and need constant attention, oca usually fends for itself very well. The most common problem here is a bacterial stem rot, but it usually occurs late in the growing season and has little effect on yield. Oca varieties frequently test positive for two different virus groups, but they show very little in the way of symptoms either in the foliage or in production. Other than these, there is one problem that I commonly see and I am not sure if it is a disease or a physiological disorder. 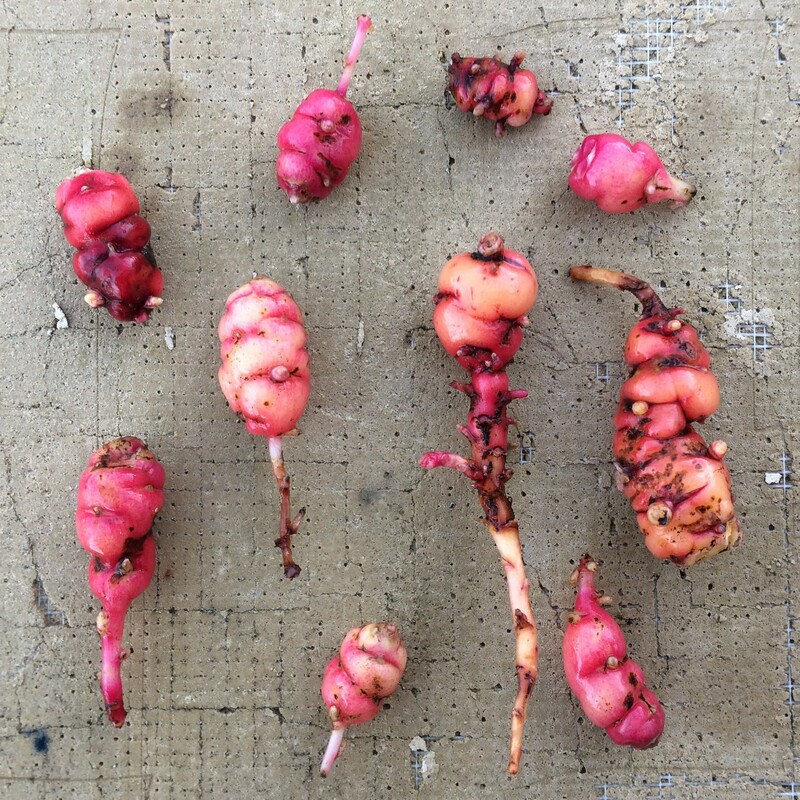 I haven’t seen it described elsewhere, but I have talked to some other oca growers who have seen the problem. As far as I can tell, the symptoms are restricted to the tubers. At harvest time, when the tubers should be fresh and fully dormant, some of the tubers, usually those closest to the surface of the soil, have growth at some of their eyes. Usually it is only at the eyes closest to the proximal end of the tuber, but occasionally, the whole tuber is affected. The sprouting sometimes continues for several nodes down the stolon as well. Badly affected tubers are studded with little white sprouts at each eye. The growth from these early sprouts is generally minimal and it does not proceed at the usual pace observed during the normal break of dormancy in the spring. In fact, affected tubers will usually still store reasonably well, although not as well as unaffected tubers. Plants often yield poorly, although they sometimes have normal yields of mostly normal tubers. The tubers often look a bit shrunken and are sometimes discolored, which could be a consequence of diverting energy into sprouting. The prevalence of this problem has not changed significantly over time. Some years I see this problem in about 1 in 8 plants of affected varieties. In other years, it hardly occurs at all. Some varieties are particularly prone to this problem, such as Sunset and Pink Dragon. Black, Blood Red, and Redshift occasionally show this symptom, but generally only in a few tubers. Most other varieties never develop these symptoms. It seems that when tubers with this problem are planted, the next harvest always includes affected tubers. When asymptomatic tubers are planted, they generally yield the same. This suggests a disease. It is probably not a virus because we have plants that never show these symptoms that have the same virus profile as affected plants. It could be a virus that those varieties are just particularly vulnerable to, but it seems more likely to be bacterial or fungal. I have looked for obvious signs of both bacterial and fungal infections, like fungal bodies on the skin and abnormal vasculature, but there is nothing blatantly obvious other than the skin discoloration. These are observations based on a fairly small number of plants and no controlled testing, so it is also quite possible that this is a physiological disorder. It seems to be much more prevalent in years when we get an early frost. My original hypothesis was that freezing in the soil at the surface was causing just enough damage to the tubers to cause them to break into emergency growth. This is bolstered by the fact that the deepest tubers are almost always unaffected by this problem. But, the fact that symptomatic tubers generally yield more symptomatic tubers is quite suspicious. What should you do if you see these symptoms? I recommend not saving seed tubers from plants that have any affected tubers. In general, I cull any plants that have unrecognized abnormalities. It might be a disease or it might not, but there is no sense in propagating from tubers that look questionable. Affected tubers don’t taste any different, so eating them is a perfectly good way to get rid of them. For now, that is all that I know. I have reserved enough tubers with this problem this year to do a more controlled test grow next year. I will grow them in fresh soil and harvest some plants both before and after frost. We’ll see how the number of affected tubers compares in in symptomatic vs asymptomatic seed tubers. Unless, of course, someone out there recognizes these symptoms and can identify the cause. If so, please get in touch! A guy can dream. This entry was posted in Blog, diseases, oca (Oxalis tuberosa). Bookmark the permalink.